Homeowners save significantly on their annual home insurance expenditure by choosing the appropriate deductible. Gavop’s recent analysis of net savings earned from home insurance plans with higher ($2,500) and lower ($500) deductibles in Waterloo, Iowa shows that homeowners in the city can save as much as $920 by choosing the lower deductible plan. This citywide calculation is based on a hypothetical claim amount of $1,500. For a $500 deductible, homeowners in Waterloo pay a median yearly premium of $550 and incur a total of $1,050 in yearly expenditure. With a higher deductible of $2,500, these values are $470 and $1,970, respectively. In the state of Iowa, homeowners opting for the lower deductible plan pay an average yearly premium of $550 and incur a yearly expenditure of $930. Those opting for the higher deductible plan pay an average premium of $450 and incur annual expenditure worth $850. The statewide net savings for the higher deductible plan is $80 for a hypothetical claim amount of $400. The Gavop study also analyzed home insurance premiums in locations within a 50-mile radius of Waterloo. For a hypothetical claim amount of $500, homeowners of Poyner, near Waterloo, incur an annual expenditure of $1,080 for the lower deductible and $990 for the higher deductible. Thus, the net savings for those choosing the lower deductible is $90. In Chickasaw County, another neighboring area, the net savings is $20 less at $70 for the same claim amount ($500). The annual expenditure for the lower deductible plan here is $870, and it is $800 for the higher deductible plan. Homeowners in Poyner pay a median yearly premium of $580 for the lower deductible and $490 for the higher deductible. In Chickasaw County, the median insurance for the lower deductible is $370, and for the higher deductible it is $800. 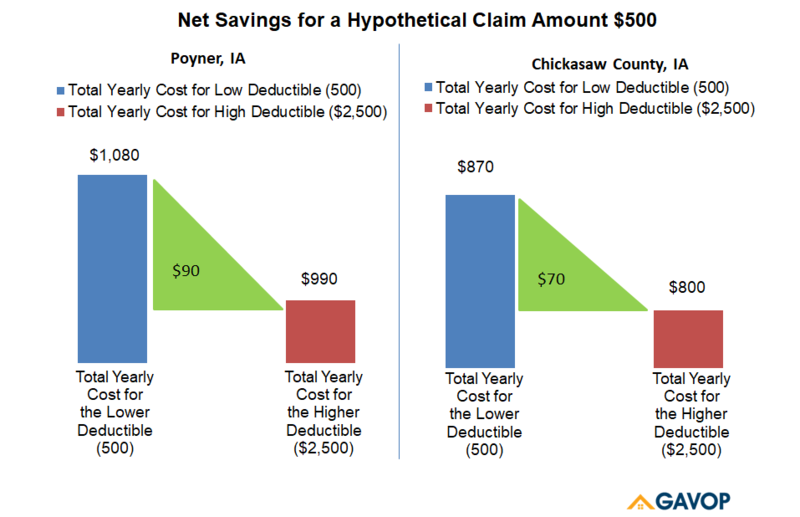 The chart below compares the savings in home insurance between Poyner and Chickasaw County. The following table calculates the net savings from home insurance for the two deductible plans against a hypothetical claim amount in 10 locations within a 50-mile radius of Waterloo, Iowa. Ajay Kumar works as a data analyst with Gavop. A (software) engineer by profession, he utilizes his well-established programming skills in big data, to derive insights from a wide variety of data sets. A engineering graduate from JNTU his passion involves analyzing raw data, infographics and other visual aids for research.